Women in Greater Manchester are inviting people to peek inside their handbags as part of an art exhibition. The bags, which contain personal items from shopping receipts to medicines, are being used to highlight the impact of recent public service cuts on women. They also features sound recordings of women talking about how their lives have changed over the past year. More than 60 women took part in the Bags of Attitude project in association with Oxfam. 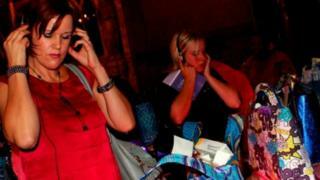 Artist Charlotte Newson, who led the project, said: "You are able to listen to the women's stories through headphones as you rifle through their handbags. "Handbags are very personal things and the items in a woman's handbag reflect her life. "With so many public services closing over the last year due to spending cuts we wanted to reflect the impact on women." The project features more than 40 handbags created by women aged from 19 to 80. Items in the bags include used bus tickets, medicines and shopping bills from 2011 to 2012, reflecting the rise in household costs. Ms Newson added: "The women talk about their lives - how things have changed over the past year and how the facilities she relied on have gone through public spending cuts. "There are lots of receipts from budget supermarkets and pound shops. "The shutting down of care services such as Sure Start centres and after school clubs has a great impact on women. "Women, who are more likely to be carers, may be forced to give up work and may have to enter the benefits system. "These are the real women behind the headlines. In this exhibition you hear from them directly - it is giving them a voice. "Although this a celebratory project we are dealing with very serious issues." The Pankhurst Centre display runs at Number 4 Piccadilly Place, Whitworth Street, Manchester from 11 to 28 February.